Plot: Paddington lands in unexpected trouble - and prison - when he attempts to buy a very special birthday present. Release Date: On digital download 5th March. On DVD, 4K UHD, Blu-ray, & Blu-ray steelbook, 12th March. Format: DVD, Blu-ray, digital download. Cast: Jim Broadbent, Brendan Gleeson, Sally Hawkins, Ben Whishaw (voice), Hugh Grant, Julie Walters. In a world of increasing intolerance, the trust, openness, and positivity of one little bear is the antidote we all need. Borrowing much of its physical comedy from the likes of Laurel and Hardy and Chaplain gives Paddington 2 a charming, old school appeal, which is sure to hit the right notes with family audiences. 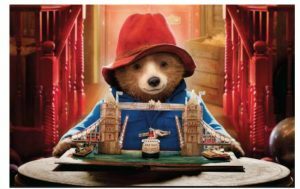 But, while Michael Bond’s seminal creation will probably never be ‘hip’, Paddington 2 is still very much a film for the now. It’s a film set in a happily diverse and multi-cultural city. It’s a film with a migrant as its lead. It’s a film that celebrates positivity and doing the right thing. It is, in many ways, a film designed to counter-act the judgemental, island-nation mentality that seems to have become the default-setting in many parts of the media. But let’s not over-egg things. It’s also a heart-warming, life-affirming and utterly, utterly charming film about the mis-adventures of everyone’s favourite bear: Paddington. Designed as a sequel to Paul King’s 20014 hit, this latest outing sees Paddington on a mission to buy his Aunt Lucy a birthday gift, with disastrous consequences. The film expands Paddington’s world considerably and the London we find ourselves in is suitably mythologised. An anytime city where mobile phones don’t exist, but red phone boxes do, where ‘fat’ TVs sit alongside modern computers, and where the Shard dominates the skyline but everyone lives in Edwardian mews. Hugh Grant proves himself a natural comedian with a self-depreciating performance that’s good enough to make you forgive every bit of foppish nonsense he’s previously appeared in. Hugh Bonneville and Sally Hawkins are endearing as Mr and Mrs Brown. And Brendon Gleeson is perfect as the convict cook Nuckles McGinty. 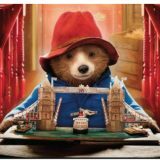 Paddington 2 is very firmly a family film, though perhaps not one for the under fives. There’s quite a lot of story packed into the film’s 103 minutes – and that may be all a bit much for the little ones. However don’t let that put you off. This is a film that you should see – and take others to. In a world of increasing intolerance, Paddington 2 is the antidote we all need. A little bear with a big heart whose natural trust and openness makes the world around him a better place. It will make you laugh, cry, and send you back out into the world feeling much, much warmer.